Adelaide faces 75% chance of more of the same. When your power supply depends on the weather, it somehow seems fitting that the chances of having power should be forecast in much the same way. Robert Gottliebsen is a finance and economics columnist with The Australian who has been out and about, talking to engineers about Australia’s energy crisis; and seeking to fine tune his blackout forecast, following the closure of Victoria’s Hazelwood coal-fired power plant, representing the loss of 25% of Victoria’s base-load generation capacity; capacity that has, until now, not only kept the lights on in Victoria but in South Australia, too. I have moved around the country to find out exactly how bad is the Australian energy crisis. I located people who, unlike the government officials who advise politicians, actually know what is happening and are anxious that I pass on the information to my readers, and therefore the nation. The looming crisis is much worse than I expected. Three state governments, Victoria NSW and South Australia, have vandalised our total energy system. The Premiers of each state clearly had no idea what they were doing and did not sit down with top engineers outside the government advisers to work out the best way to achieve their objectives — whether that be an increase in renewables or gas restrictions. Not until Josh Frydenberg came to be energy minister did the Commonwealth start to understand the extent of the disaster. Prime Minister Turnbull and Frydenberg have taken the first step in overcoming the problem with the Snowy pumped hydro scheme, but it is only a small step and will take two or three years to be effective. Without urgent action residents of NSW, Victoria and South Australia have a 75 per cent chance of blackouts next summer if the Hazelwood power station shuts on April 2. 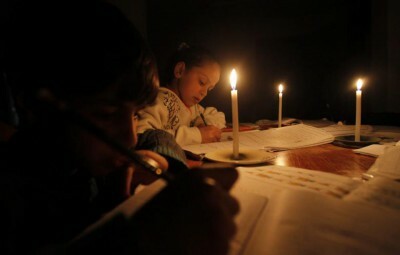 Those blackouts will cost the nation tens and tens of billions of dollars in the food, medicine and processing industries. The Gladstone venture, in particular the Santos consortium, in effect “shorted gas” — i.e. signed contracts to sell gas they did not have while Shell has gas in the Bowen Basin but it is proving more costly to extract than expected Australia’s energy mess to spark our own Trump revolt. All industries and consumers will experience much larger energy costs from the network — but to be safe must also consider spending vast sums to be prepared for the power and gas shortages. This is third world. We have a power grid that has not been engineered for the decentralised sources of power that we are now generating led by renewables; many billions must be invested to make it efficient and that will have to be paid for by power users. The knowledge of how best do this is not held within the state or federal governments. The Snowy will help longer term but it won’t overcome the short-term crisis and many more Snowys are required. Residents of NSW, Victoria and South Australia have a 75 per cent chance of blackouts next summer. In the summer just past it was very hot in NSW and Northern Victoria, but cooler in Melbourne. We had blackouts in South Australia and went close to blackouts in Victoria/NSW when several NSW generators hit technical problems. If the wind and solar generation units installed to replace coal fail, as occurred in South Australia, there is not sufficient backup both in raw capacity and in network design. To lock in the likelihood of blackouts for next summer the Victorian government is encouraging and allowing the closure of Australia’s largest generator: Hazelwood. Without Hazelwood, if it is simultaneously hot in Sydney and Melbourne blackouts are certain unless there is also a lot of wind in the right places and the network can get the power to the capitals. Answer: subsidise Hazelwood’s continuation at least until a clear plan is engineered to replace it (maybe NSW generators need to be boosted; certainly totally new back-up systems to solar and wind must be devised and implemented). The problem with back-up gas (or any other sort) is that if you are producing large amounts of electricity from wind and solar then these back-up plants are only required for, say, 10 or 20 days a year. It makes them very high cost and totally uneconomic. That’s why Engie’s Point Pelican gas plant in South Australia was shut during the crisis. The cost of erecting and running uneconomic back up plants to wind and solar must be costed into the renewables projects. It has not been. Victorian and to some extent NSW gas is stored at the Iona and Longford gas storage facilities during summer so there is gas available in peak times during winter. Unfortunately this summer extra gas was used for power generation while the Gladstone LNG plants sucked gas from Victoria to LNG export which means that its going to be close as to whether there is enough gas available this winter in Melbourne and Sydney. Without government action there is no chance of there being enough gas in the 2018 winter. Current prices are twice the old domestic price might double again as shortages kick in. The energy market says Santos and Origin consortiums in Gladstone “shorted” gas by signing contracts to export gas they did not have. The Origin consortium denies this (and I accept the denial) and says it has plenty of gas. It says that Santos is the only consortium shorting gas (my words). But it is very tangled. Shell has enough gas via its British Gas acquisition but it was expected to have Bowen Basin gas available to cover the net “shorts” of Gladstone. In the early days of Gladstone saga, Origin and Santos had reserves as a joint venture and Santos did not dream Origin would set up a rival LNG plant partly using Origin’s share of the jointly owned gas. Origin left Santos in the cold to thwart a British Gas takeover bid (BG is now part of Shell). Again, it’s a very messy web. Meanwhile, leaving aside individual consortium guilt or innocence, Gladstone in total is draining gas from Bass Strait and the Cooper Basin, offering much higher prices. There is available gas in Victoria and NSW but former NSW premier Mike Baird and Victorian Premier Daniel Andrews have stopped development. Solution: People who short shares or commodities usually are aware of the dangers of such practices. Malcolm Turnbull and Josh Frydenberg need to teach the shorters the danger of such practices. As I understand it, some 5 per cent of the Gladstone exports need to be diverted to the local market. That might be organised on a voluntary basis. If that can’t be done, the Commonwealth needs to use emergency powers to divert 5 per cent of the total Gladstone output to local use. Normally I would oppose such an action but we face an emergency, albeit partly brought on by Messrs Baird and Andrews. National Party leader Barnaby Joyce needs to convince farmers that the Queensland scheme, which sees farmers enriched if gas is found on their land, will be implemented in Victoria and NSW via a condition in environmental approvals or some other mechanism. He also needs to convince them that fracking is safe although Victoria can cover the shortfall without fracking, an easy fix for our east coast gas mess. There is also gas that can be piped from Northern Territory and/or the Bowen Basin gas. But both deposits require time and money to produce and pipe the gas. Gas prices will stay high. We have a power grid that has not been engineered for the decentralised sources of power that we are now generating. A decade or so ago we had a centralised power grid where large amounts of power was generated from concentrated sources and was distributed to the retail network. Now power comes from a vast variety of sources that are geographically dispersed. Many industrial users have their own power and, of course, households have solar panels. All these power sources seek to export power via a grid that was not designed this way. At present the system is an inefficient mess. The state decisions to install solar and wind power should have been accompanied by a very detailed plan to change the distribution system. This is the job for skilled engineers rather than by public servants and ministerial advisers seeking Green votes. Its not that the solar and wind decisions were wrong but communities needed to be told the whole picture. The trouble was most politicians either did not know or did not want to know. They were after support from Green voters and the media. If the wind and solar generation units installed to replace coal fail, as occurred in South Australia, there is not sufficient backup both in raw capacity and in network design. Wind power and solar for that matter do not and cannot “replace coal” as a power generation source: coal-fired power is available 24 x 365, irrespective of whether the sun is out or the wind is blowing. And the claim that South Australia’s power crisis is due the fact that wind and solar units ‘fail’, suggests that Robert believes that the routine events known as ‘sunset’ or ‘calm weather’ are not part of the renewable energy system’s ‘design’. 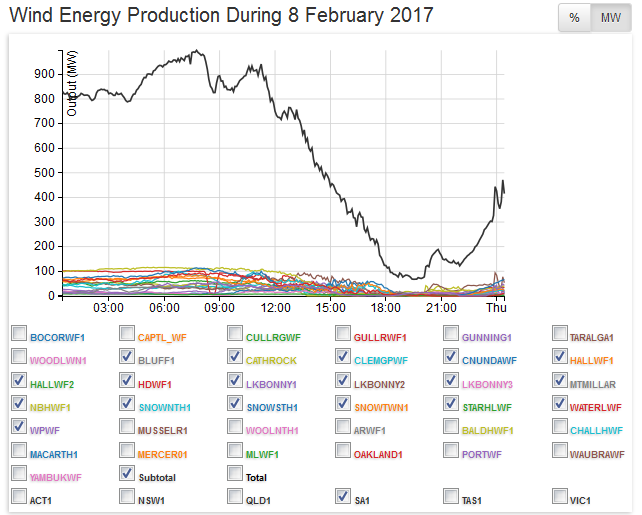 If the inability to produce power when the sun goes down or the wind drops counts as a ‘fail’, then those kind of ‘failures’ are a daily occurrence – just like the failure that occurred on 8 February this year, which left 90,000 South Australian families sitting boiling in the dark (see above). Then there is Robert’s angle about people going “off grid”. That’s clearly happening in South Australia, but the businesses purchasing high-capacity diesel generation sets aren’t doing so willingly: it’s a matter of economic life or death. And it’s all very well for Robert and people of his means to encourage people from the same strata to build mini power stations on their roofs and in their backyards, but there are plenty who are stuck on the lower rungs of the social and economic ladder who can’t afford to splash out $30,000 for a self-sufficient system of solar panels, Tesla batteries and generators. Vanity signalling is not cheap. No, the less fortunate struggle to pay their escalating power bills until, one day, they reach the very limit of their means, the debt collectors are sent in and their power supply is cut. 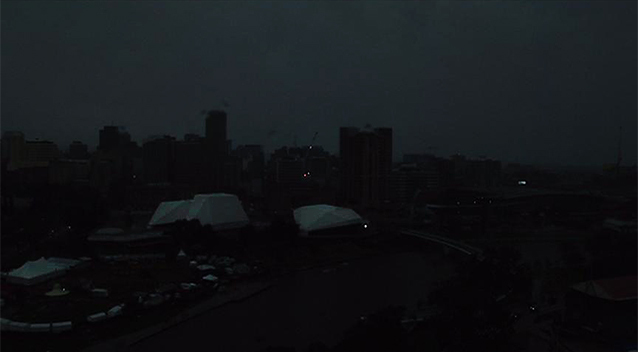 Tens of thousands of homes are disconnected from the grid in South Australia with thousands more soon to join them: using gas barbecues to cook, hurricane lanterns for light and kerosene fridges or Eskys to keep their perishables from perishing (see our post here). Australia’s Large-Scale Renewable Energy Target has not only destroyed the once world-standard reliability of our power supply, the rocketing costs of the subsidies and the need to throw hundreds of millions of dollars at state-owned batteries, diesel generators and gas turbines, as is about to occur in South Australia and $billions at an uncosted Snowy pumped hydro scheme is a form of malevolence against the poorest and most vulnerable in our society. Let’s call it a crime against the people. Then there is the effect that rocketing power prices and an increasingly unreliable supply has on the ability of power hungry industries to do business, employ people and pay meaningful wages. Again, in places like Port Pirie, Port Augusta, Whyalla, the Latrobe Valley and Roxby Downs, it’s the working classes who suffer first and most from Australia’s ideological obsession with wind and solar power. On his next lap of the country, Robert would do well to tour some of those places and talk to the people whose lives and livelihoods depend upon affordable, reliable and secure power supplies. Then Robert would be able to provide us with a forecast for the misery and unnecessary suffering that’s about to be caused by Australia’s suicidal renewable energy policies. Welcome to 14th century Australia thanks to the Greens, Labor, and the Loony left wing school teachers who have never had a real job in their life but espouse saving the planet by returning to the horse and candle age. I don’t know if I’m misinterpreting something though I don’t know how I could be…but have you read much about this new AEMO boss from New York…said to have been Hillary Clinton’s favorite for her energy czar? No one seems to be talking about her, but I think Turnbull must be thumbing his nose at Australia if he’s approved her to run our energy system and wants us to think he’s serious about energy security….it looks more like proof that he’s working for Labor but that would be mad. Audrey Zebilman…presumably approved by Turnbull and Frydenberg…has the EXACT SAME POLICY for Australia’s energy future as GreenLabor ie she’ll KILL COAL & GAS…asap by the sound of it…and thinks she’ll have Australia 50% renewable by 2030…or sooner because she plans to make Australia the world leader on incorporation of wind and solar power via storage and ‘demand response’…a method which I can only think would require huge interference in our lives and ultimately coercion. Zebilman left her job with the NY Public Service Commission just days ago …a year ahead of her 2018 contract expiry date …amid controversy re her plan’s closure of the Indian Point nuclear plant, the State’s huge electricity prices and fears of energy insecurity. She told NY State if they have problems without base load they could ‘lean on hydroelectric power from Canada or other options’. Zebilman was a subject of controversy due to undisclosed conflict of interest ..both she and her husband having companies that stood to make possibly billions from decisions she was in the ultimate position to influence …he being CEO of a company that’s seeking billions ‘to connect the nation’s electric grids and allow for greater growth of clean energy’. Apparently she and Alan Finkel are totally ‘in sync’ so I guess he influenced Turnbull. How Frydenberg and Turnbull can insist that coal and gas have a future in Australia …having hired this woman…is a mystery to me. Looks to me more like a sick joke v Australia…and we’re all to be the lab rats for the Left’s big experiment. And today we here in SA have just heard more of the deception relating to Alinta’s attempt to keep the power on in SA and our ‘Government’ led by Weatherill and Co. who have no interest in keeping the power flowing in this State. It beggars belief what this Labor government has done to this States and is being blindly repeated by other States. We hear they did not support a re-fit to gas of the Port Augusta plant, they did not support using black coal instead of brown, they did not agree with the creation of a pipe line or storage close to the existing pipe lines and that was before Alinta asked for help to keep the place running for a few years until alternate energy supply sources could be sorted out. What this SA Government and those elsewhere have done is place their personal ideologies of running on wind and solar ahead of their States and Nations future. Idol-ism is something that should be left to star struck teenagers not those who are meant to look after the people of this Nation. When will Governance in this Nation return to a position of putting the people first before personal ideology and idol-ism? It must feel good to know that Australian taxpayers are funding acoustic engineers to do vital research, rather than wasting their time on, say, measuring wind turbine emissions. Thanks for the link auralay. As an electronic musician myself, I for one am far more interested in exploring the negative acoustic emissions emitted from industrial scale wind turbines. Whilst some interesting work will no doubt come out of the snapping-shrimp research, I would rather explore the infrasound emissions from 40 metre long 7-8 tonne wind turbine blades. They intrude on my life every day and I do feel the effects. I want to know why? Much can also be explored during the music mastering process. ” Dr Tomlinson said following the rules of science could often be limiting. I think she just defined climate science. Tesla is a brand name of Tesla Inc not a technology. The technology is Lithium Ion. By referring to batteries as Tesla batteries, we infer that Tesla is a technology unto itself with some sort of mystique, when in fact RAPS (remote area power systems) has been with us for decades. Tesla is just another freeloader with a glib marketing ploy jumping on the renewable gravy train. Come on, folks, call it what it is. Oh, by the way, Christmas last year, my wife and I finally had enough of the wind farm sonic torture and sold up our totally off grid and self sustainable home and moved over 40Km from the nearest wind turbines. We were deeply saddened to sell up and move, but personal health is more important especially as age is rapidly catching up on us. My father died at age 72. I for one didn’t want to sit around for the next 4 years suffering wind turbine noise with no sign in the immediate future that the turbines affecting us just might be removed in that time period. So, we are now not only grey nomads but also wind farm refugees. This weekend, we pack up our ute back camper yet again and go bush for a few weeks as far from turbines as possible. David, the “Tesla” Lithium ion batteries used in both the Tesla plug-in electric cars and their Power Wall stationary batteries are based on Panasonic technology. Tesla latched onto the Panasonic developed technology and now has a battery manufacturing joint venture with that company. In common with other Tesla ventures it’s funded by billions in US taxpayer hand-outs! Faith and trust in ones fellow humans is a necessity for a society to function in an orderly manner. At this moment we have the AEMO reporting that the closing down of Hazelwood would have no impact on the grid. Jay Weatherill has just been caught out in regards to Alinta offering SA a life line. The Clean Energy Council continues to obfuscate the facts in relation to renewables and storage. State and federal Labor politicians continue to propagate that renewable targets of 40-50% will drive down power prices and increase employment. Our PM lurches from one side to the other in this debate and fails to take ownership of it, which will ultimately be to his detriment. As I have followed the lunacy of the push for more wind farms over the years in particular the Ceres project, myself and the late Marty Hayles in our commentary on STT tried to squeeze in a bit of light hearted humour at times in this serious matter. Unfortunately the death knell that rang out in SA last September with our first blackout, like a plague it is continuing to claim an exponentially increasing number of victims. STT is right, we need a knockout punch in the form of a mass blackout with its dire consequences before we might regain any sanity in this debate.